I have to admit that when I first read this I was a little afraid, but as I looked at the pictures I realized that this was not a ticket to a dead lawn, but more so inspiration for a natural lawn. 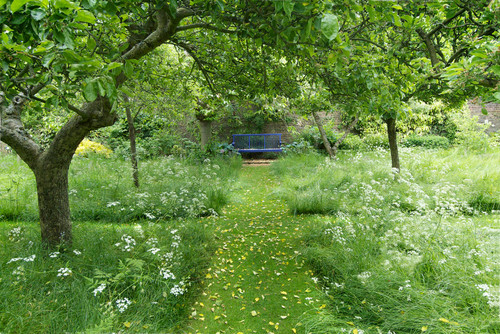 I love the photos of the natural lawn. They make me think of the countryside in Holland and also the Texas Hill Country. Here goes. I hate to admit this, but this spring I spent a lot of time, energy and money trying to get my lawn back into shape. I got a little obsessive about making it look as good as all of my neighbors. A lawn is a funny thing. Manicured grass doesn’t exist in nature and it seems to be more of a social custom created when suburban living was first developed. I don’t really love having grass but for some reason I feel obligated to keep up the appearance of a manicured lawn. There are a lot of down sides to having grass. The water use, constant mowing and the chemicals people use to make it green. There was a recent NY Times article about the shocking number and kinds of chemicals people use on lawns. The article referenced an organization that asks people to pledge not use pesticides and herbicides on their lawns for their children’s health and to prevent water pollution. Non grass lawns are becoming more fashionable lately. For those of you edgy, fashion forward folks who can withstand the grass social pressure you might want to consider a non traditional lawn. I saw this article on Houzz and couldn’t believe it. It’s a lawn on the wild side! I love some of the ideas. Are you brave enough to do something different?